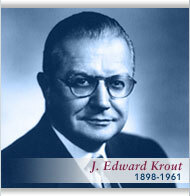 Krout & Schneider, Inc. was founded on February 14, 1927 by J. Edward Krout and Sam A. Schneider. At the time, there were no professional investigation agencies as we know them today. So-called detectives were tough guys who packed guns and hung around the free lunch counter of the local saloon. They would collect a debt if persuasion were needed. Nearly everyone drove a black Ford. Ed and Sam had the idea of a white collar service for business, law firms and insurance companies. There was a need, but they had barely started before the stock market crash of 1929 and the following Great Depression. During much of the thirties, the Golden Gate and Oakland Bay bridges were under construction. Both construction companies were our clients. A worker injured on one bridge would often go to work on the other. In 1932, Schneider, a photography buff with his own darkroom, secured a commercial motion picture rig. He filmed a malingering claimant and motion picture evidence was admitted into court for the first time. Needless to say, we have had many interesting cases. Chasing crooks and matching wits with fraudsters is hard work, but fun. And being asked for our input by attorneys and execs trying to solve a problem is rewarding too. Today, K & S is still the leader in subrosa investigation, but we also specialize in employee misconduct investigations. Our undercover investigators and interviewers are the bane of thieves and drug dealers in the workplace. Our pre-employment screening division, SmartHIRE, conducts background investigations nationally for all types and sizes of employers. 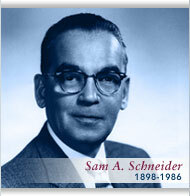 Ed Krout died in 1961, but Sam Schneider remained active with the firm until his death in 1986. Starting in the fifties, Ed and Sam began one of the first employee stock ownership programs, insuring built-in continuity of management and excellence of service. Many of our employees have decades of experience and service. We are proud of our history and appreciate the loyalty of clients who have trusted us for three-quarters of a century.